Title screen from South Park. South Park is an animated comedy series that airs on Comedy Central. Debuting in 1997, the show is noted for its dark humor, crude language, and topical content, and has garnered many awards and nominations including the Emmy Award for Outstanding Animated Program. This page will list all the references between Futurama and South Park. 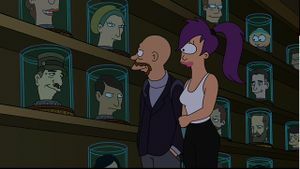 Eric Cartman's head is seen in the Head Museum when Lars Fillmore and Leela are walking through it. Fry, as he's walking out on the ceremony where he receives the Deliver Boy of the Year award, yells back to the event "...and the fishsticks were limp! ", possibly a reference to South Park's "Fishsticks", aired 2009. Were the writers of "Near-Death Wish" to claim otherwise may play into a particular sub-plot of that South Park episode. Eric Cartman's head in the upper right hand corner. In the episode "Go God Go" (aired 1 November, 2006), Cartman is stuck in the snow and is buried by an avalanche and is defrosted 500 years later. Although not an explicit reference to Futurama, there is brief reference to cryogenics, and the name of the city "New New Hampshire" is familiar to other names of cities used in Futurama, like "New New York". This page was last edited on 7 December 2013, at 19:03.